To the south of Srinagar’s famous Dal Lake is the Pari Mahal, perched on Zebanwan. 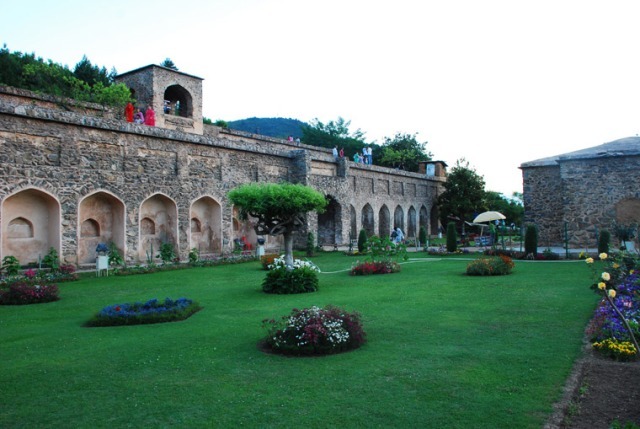 This garden was built by the Prince Dara Shikoh, one of the sons of Shah Jahan, in the middle of the 17th century. Dara Shikoh is perhaps better known as the prince who was supposed to have succeeded his father, only to perish from assassination at the hands of his sibling, Aurangzeb. Pari Mahal-which translates to the Abode of Fairies-is said to have been built upon an old Buddhist monastery that had fallen into disuse and disrepair. The garden then served as an observatory whereby the nobles and the Sufi mystics would discuss the study of the stars and heavenly bodies. Astrology was apparently a great interest of the prince. There are details to Pari Mahal that make it special even amongst the other beautiful gardens clustered around the lake. For one thing, this is the only garden of note here that has no chadars-the stone ramps the Mughals used for carrying water from one spot of the garden to another. Most of the gardens nearby, including the Nishat Bagh and the Chashme Shahi, use these ramps to carry water from one terrace to another, but the Abode of Fairies does without them by employing underground irrigation instead. It is also said that back in the day, the garden actually had its own spring, which is alleged to have been located just above the water tank on the sixth terrace (the garden has six terraces, all told, so this would be the one perched highest of all). Unfortunately, this old spring is no longer functioning. Another point of curiosity is the patent discrepancy in splendour and complexity of design between the first three (counting from the bottom) terraces and last three terraces of the garden. One need only spend some time in either half before moseying over to the other to see what visitors as well as scholars mean: the lower three floors are far plainer in comparison to the rather grand and detailed designs of the fourth to the sixth floors, yet all six were definitely built at the same time. Scholars allege that this must mean that only the top three floors were built with a view to exclusivity. Typically, one enters the Pari Mahal from the fourth terrace’s entryway. This is said to have been the case even back then, during the prince’s time, for the structure of the arches and the garden itself indicate it. Nowadays, it is fairly easy to get to it since there is a road leading to that entryway, and the state government has been taking other steps towards renovating the garden and making it more attractive to tourists. While the garden is absolutely breathtaking in the mornings and afternoons-as well as a superb vantage point if you want to take panoramic photographs of Dal Lake and the surrounding area-it can also be a rewarding place to pass by at night, because it is lit up rather splendidly then.